Hovering uncertainly between a mangled mass of uprooted trees and a ferocious precipice, the little blue house is a minor rainstorm away from plunging down the mountainside into obliteration. From the cornflakes box on the porch and the forlorn dog slumped at the front door, it's clear the owners left in a hurry. One of dozens of homes abandoned in the village of Petite Savanne - the reluctant centrepiece of Dominica's worst disaster in almost four decades - it's a startling testimony to the way nature can unleash its fury at a moment's notice. Tropical Storm Erika was notable less for its speed than its stealth, arriving without warning in the early hours of 27 August as islanders slept. Dumping 13 inches (33cm) of rain in 12 hours, it turned mountainsides to mush causing catastrophic landslides, and rivers into rushing overflowing torrents, claiming 34 lives and devouring 271 homes across the island. Today, as the Caribbean island battles to pick up the pieces, two government workers have flown into Petite Savanne by helicopter in an attempt to convince the handful of remaining residents of the danger they face should more rain fall. Here, the colourful sprawling homes, flanked by manicured hedges and expensive cars, are a far cry from the flimsy structures one might expect given the magnitude of the damage. It's immediately apparent that this was a prosperous place, buttressed by its location at the heart of Dominica's bay oil industry. The absence of most of its 700 residents has left it ghostly quiet - the current population of 18 doubled by the police sleeping in the village church to deter looters. 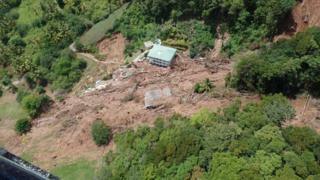 The homes still standing may look sturdy enough - but the steep terrain has left them vulnerable to further landslides. Omegar Francis' girlfriend fled with the couple's two children as soon as it was safe to do so. So far he's ignored official warnings to follow. "The last few days have been rough," he admits, "but my house is far from the river so I'm not afraid." Phillip Darroux, 52, is also determined to stay, despite the fact all main roads in and out of the village have been destroyed, leaving Petite Savanne dependent on daily food drops by emergency helicopters. Asked what he plans to do when the supplies stop, he says: "People don't need a lot of money here. In the old days, we lived on what we grew and drank spring water." Another resident, Johnson Destouche, simply says he has nowhere else to go. Officials still don't know if Petite Savanne will ever be rebuilt. For now, Dominica's focus is on re-housing the 400 islanders sleeping in shelters and paying the $220m (£130m) needed to fix the country's wrecked roads and bridges. Just 12 bodies have been recovered to date - a further 22 people are missing, presumed dead. Four communities are still completely cut off, and Dominica's two biggest industries - agriculture and tourism - have been pummelled by $9m and $10m losses respectively. Another $14m is needed to fix the international airport. Nonetheless, Dominicans have shown themselves to be a stoic bunch, with everyone from power plant staff to relief effort co-ordinators toiling round the clock to get the country functioning again. Debra Charles-Mark, owner of self-catering Ohlala Villas in Delices, estimates it will take three years and $400,000 to return the enterprise she describes as her "pride and joy" to its former glory. "The business was just taking off; we didn't yet have the money for insurance," she says sadly, surveying the ruins of the smashed cottages and swimming pool. "But we are determined to rebuild." Astonishment at the storm's sheer, unexpected savagery is a recurrent theme. Edward Laurent, from Mahaut, described it as the worst he's seen in his 75 years. And Gittens Anglaise, 43, of Colihaut, related tales of leaping from a window and shinnying across the water along electrical wires "like Rambo". His neighbour Molly John had been out celebrating her 20th wedding anniversary when the storm struck. She returned to find her home and adjoining restaurant submerged in water "up to the doorframe" destroying thousands of dollars worth of appliances. "I used to cook seven days a week; now I have no income," she says. "We lost everything, even my children's school uniforms." One of the tourism industry's biggest casualties is the Jungle Bay resort - most of its 35 luxury lodges were pulverised. Spa manager Dafrica Summers credits "divine guidance" with keeping all of the 43 holidaymakers there at the time safe. Tourism Minister Robert Tonge told the BBC it was "heartbreaking" to witness the destruction to one of Dominica's economic lynchpins, but vowed: "It may look like all is lost but we are resilient people; we will build back up." He said he hoped the international airport would reopen in the next two weeks. For many, the emotional trauma may take a little longer. "Will we ever be completely back to normal?" Molly John adds, regarding the muddy waters with a shudder. "I don't think so; people will always be scared of the river now."